Armadale, an investment company focused on natural resource projects in Africa, reports its unaudited interim results for the six months ended 30 June 2018. Armadale (LSE:ACP), an investment company focused on natural resource projects in Africa, is pleased to announce its unaudited interim results for the six months ended 30 June 2018. 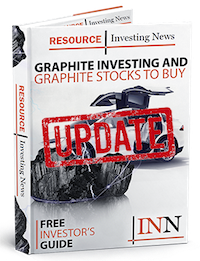 “Our objective to confirm and highlight the commercial viability of our 100% owned Mahenge Liandu Graphite Project in Tanzania is now gaining momentum. The completion of the Scoping Study in April was a significant milestone and the results, which underpinned the highly robust fundamentals which could be achieved at Mahenge Liandu, gave further support to our strategy of fast-tracking work ahead of a decision to mine in early 2019,” Nick Johansen, Director of Armadale, said. “We believe that there is now a window of opportunity for Armadale to capitalise on our various competitive advantages at Mahenge Liandu – made possible by the simple geology of the project, the well-understood metallurgy, the quality of the high-grade mineralisation and the relatively straightforward mining techniques which we anticipate would be amenable to exploit the deposit. We are confident that this will provide us with a low capex, low opex mining operation capable of delivering a very high grade and commercially attractive product which is in high demand for multiple industrial applications. “We certainly have the right asset and the right end product, but we believe we have the right postcode too. Mahenge Liandu is flanked by some of the world’s major new graphite discoveries, and we see the recent political and legislative developments in Tanzania, particularly the formation of the new Mining Commission, as a significant and positive move to reaffirm the countries’ position as one of Africa’s premier mining destinations. We are encouraged by the impact that the Mining Commission has had in just a few months since its formation, and we view this as a further signal of Tanzania’s general spirit of cooperation when looking to foreign investment and unlocking strategic natural resources for the benefit of all stakeholders.